Melanie Ben worked at the House Committee on Natural Resources during her Udall internship. Melanie Ben (‘17) and Christine Jordan (‘16) spent ten weeks in Washington D.C. this summer they will cherish forever. As recipients of the prestigious Udall Native American Congressional Internship, they gained hands-on experience in tribal government relations and worked on a number of projects aligned with their career goals. Ben, a member of the Navajo Nation, has a strong interest in working as an advocate on behalf of tribes and protecting tribal natural resources. She worked in the House Committee on Natural Resources. 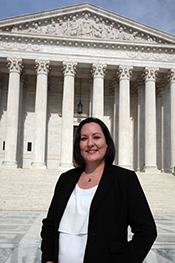 Christine Jordan worked at the Office of Tribal Justice during her Udall internship. Jordan is a member of the Blackfeet Tribe of the Blackfeet Indian Reservation of Montana. Her goal is to advocate for American Indian children in the justice system by working for the federal government. She worked in the U.S Department of Justice in the Office of Tribal Justice. Read about their experiences below. 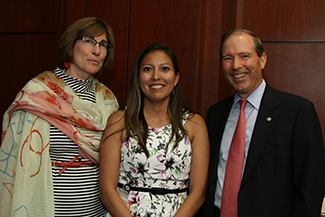 Melanie Ben, Senator Tom Udall, and his cousin Dr. Anne Udall. At the Office of Tribal Justice (OTJ), I worked on Native American youth suicide, incarceration rates of Native Americans, Public Law 280 issues, Native American Graves Protection Act, and the OTJ contribution to the first ever Native Youth Gathering sponsored by the White House. I also worked on research and legal analysis for the OTJ's contribution to the amicus brief for a case going before the Supreme Court. I worked on various projects pertaining to tribes. The House Committee on Natural Resources houses the subcommittee ─ IIANA (Indian, Insular and Alaskan Native Affairs). As a result, almost every issue pertaining to Native Americans had to go through the Natural Resources Committee. I had the opportunity to sit in on meetings with tribal leaders from various tribes such as the Three Affiliated Tribes, the Cherokee Nation, and the Navajo Nation. Hearing both sides of controversial issues such as ICWA (Indian Child Welfare Act) was a great experience. One week we heard from the tribe and the following we sat down with adoption attorneys. I also had the opportunity to run my own meeting with lobbyists. The lobbyists presented to me, showed me maps of where their client was located and provided me with other important information, which I then related to my supervisor and the ranking member of the committee. Other projects included researching legal issues and writing memos which were then sent to all staff members of the committee and all representatives that were members of the committee. Jordan (bottom left) with other interns in the Office of Tribal Justice. How do you think the Udall Internship will help with your career goals? The internship gave me the opportunity to experience Washington D.C. first-hand, and learn how the branches interact. This internship and the people I met helped me identify my career goals. The Udall internship helped me realize how important it is to know the political arena in D.C. I had an amazing supervisor who showed me how important it was to have the right representative introduce a bill. I learned that lobbyists need to be well informed of this arena to be the best representatives for their clients. Tribes need individuals that have this understanding in order to have effective laws set in place. My experience in D.C. made me realize that I may want to be a lobbyist in the future. What’s the overall take-away/benefit of your internship? 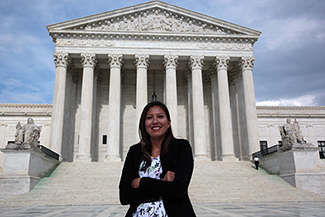 There are endless opportunities for Native American law students, and hundreds of people that are more than willing to help them get to Washington D.C. Although there are people who do not understand the issues that face tribal communities, there are many passionate people that are working hard to protect the rights of Native Americans in Washington D.C. The overall benefit of my experience in D.C. was the connections I made as well as my understanding of congress. Learning about the federal government through hands on experience helped me to gain a perspective I did not have before. Reading my Energy law text book during this first week of my 2L year had a new meaning to me when I read about the Department of Energy. What kinds of networking opportunities were there? The networking opportunities were amazing, and essential to the success of my experience in D.C. The Native American Bar Association (NABA) in D.C. set the interns up with a mentor to help guide our experiences and make the most of our time. Tracy Canard Goodluck and Craig Williams, UNMSOL alums, were in charge of these experiences. There were brown bag luncheons at government agencies, law firms, and speaker presentations where we heard from legal professionals that worked in Indian country. NABA also hosted mixers, a picnic, and an event at the Nationals baseball game to give us opportunities to socialize and enjoy our time with other law professionals. The Udall foundation had a series of events scheduled for the participants. We met with Senator Udall, Congressman Tom Cole form Oklahoma, and various organizations who work with Native American issues. In addition, the UNMSOL alumni were great! 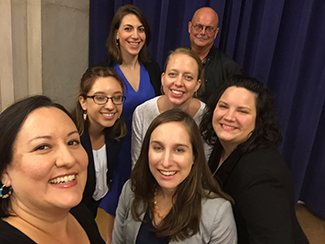 Melanie Ben and I met with a few attorneys, recent graduates, and Professor Minzner. They had a lot of great advice to offer for students considering careers in Washington D.C. The Udall internship also helped me to make lifelong contacts. I met with individuals such as Kevin Washburn, Hilary Tompkins, Senator Udall, and Representative Grijilva. I even had the opportunity to meet President Obama and hear Michelle Obama speak. I had the opportunity to make a lot of contacts and these individuals are genuine people that want me to succeed. They made time to meet with me and have told me to keep in contact with them. Were there some especially fun/memorable events or conversations? I am thankful for the conversations that I had with my bosses. Tracy Toulou, the Director of the Office of Tribal Justice and UNMSOL alum, was very generous with his time. I learned so much about the important issues in tribal communities, and how the Office is working to better the lives of Natives. One of the best experiences was going to the Supreme Court and seeing the Justices in person. Hearing them read the opinions they authored was incredible. Also, I loved that I was able to take my family to the White House. My daughter loved it! I have a couple memorable events that I will cherish forever. First, I had the opportunity to meet President Obama at a picnic held at the White House. I was put in contact with Rodina Cave who was working for DOI and she invited me to be her guest to the picnic. I shook the President's hand and said, “Mr. President, it is nice to meet you.” Afterwards my hands were shaking because I was in such disbelief. Second, I went to the U.S. Supreme Court and sat in on two different mornings to hear the Justices themselves read their opinions. Seeing Justice Ginsberg and the other Justices sitting on the bench was quite amazing. I read the opinions of these individuals all year long, so to finally see them in real life was quite an honor. There are many more great experiences but the last one I will mention was getting to hear Michelle Obama speak at the First Annual White House Tribal Youth Gathering.